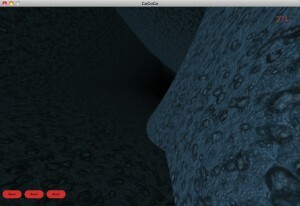 You really don’t want to see the code; this was designed and implemented in only eight hours! 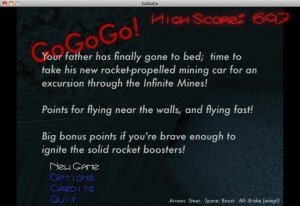 Your father has finally gone to sleep, so you’ve now got the chance to test drive his awesome new rocket-powered minecar! 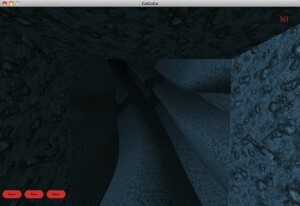 Pilot it through the Infinite Mines, scoring points for flying near the walls. The closer you get to the walls and the faster you fly, the more points you’ll earn! 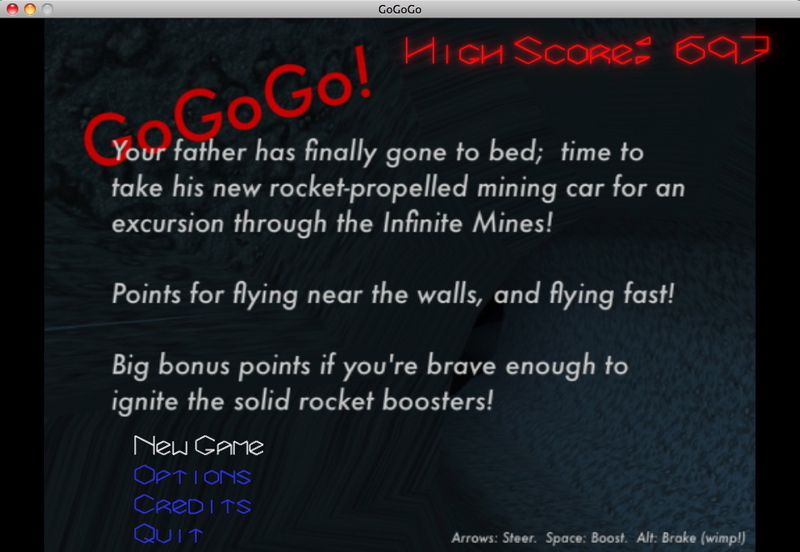 Plus, there are extra-big bonus points if you ignite one of the car’s solid rocket boosters! Especially if you live to tell the tale, afterward! Use the arrow keys to steer, and the ‘alt’ button to apply airbrakes. If you’re feeling brave (and the mine shaft is straight in front of you), then press the space bar to light one of your three rocket boosters! Warning: Once you light a booster, it will burn for three seconds, vastly boosting your speed and your score! And another warning: You won’t be able to brake while a rocket booster is burning! Rockets are dangerous, kids! Music: The Napoleon Blown Aparts – I Got It Bad. Game Design, Code & Gfx: Trevor Powell ( trevor (at) vectorstorm.org ). GoGoGo! 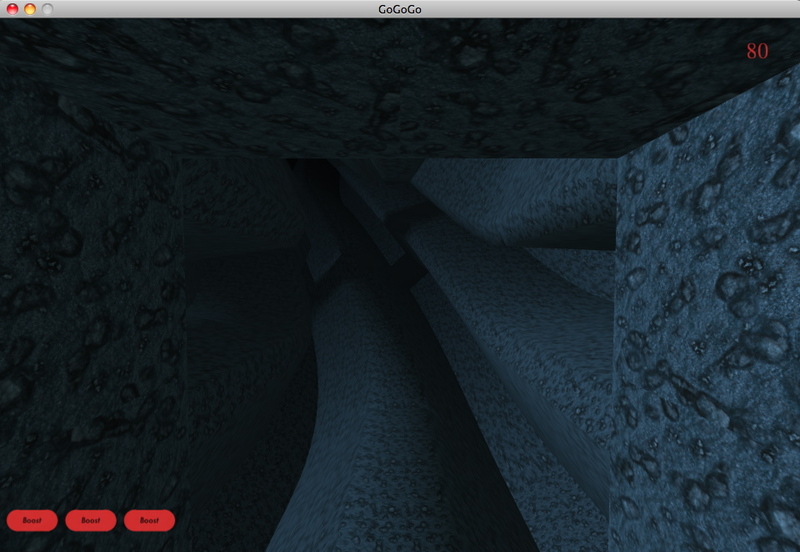 uses OpenGL, SDL, SDL_Image, SDL_Mixer, and GLEW. 1 January, 2011: Initial release (approximately 8 hours development time). 1 January, 2011 (later): 1.0.1 release, fixing Options screen crash and Mac version framework issue. 2 January, 2011: 1.0.2 release, fixing a few VBO-related VectorStorm library bugs which resulted in crashes when changing resolution or switching between fullscreen/windowed modes. Also fixed calculation of bounding radius for objects which used VBOs for their drawing (fixes formatting of the Options menu). Also added a very quick “Invert Y Axis” option.